This work, titled God's Algorithm, is a part of an ongoing series entitled "Connective Aesthetics." It explores the notion of "connectivity" and the various ways in which, today, new and often bizarre relationships are produced by way of technology. For instance, digital images involve units that are organized and re-organized within a whole and can manifest in many possible configurations. The digital image is but one example of the way that analog (for instance photography) has been transformed into units, resulting not only in a new kind of image, but a new understanding that stretches our knowledge of perception as well. My working process mirrors these technological changes as well. God's Algorithm was produced by gathering images from the Internet and adjusting them in PhotoShop. Six final images were sent via Internet to a manufacturer in California who parceled the job out to another company that printed the images on a pre-fabricated cube. Less than a week later, I received the object in Ithaca, New York by United Parcel Service. I then sent the cube via Express Mail to Artpool Archive and Research Center in Budapest, Hungary-the very city where the Rubik's cube was invented in 1976. God's Algorithm is in the form of a Rubik's cube with one digital portrait printed on each side of the cube. The tightly-cropped images are of American president Abraham Lincoln, Al-Qaeda leader Osama Bin Laden, the beheaded Catholic Mary Queen of Scotts, French president Charles de Gaulle, Bloomsbury poet Lynton Strachey, and Egyptian Pharaoh Akhenaten. Each one of these figures is diagnosed with having (or having had) Marfan syndrome-a heritable condition that affects the connective tissue. The primary purpose of connective tissue is to hold the body together and provide a framework for growth and development. In Marfan syndrome, the connective tissue is defective and does not act as it should. Men and women of any race or ethnic group can be affected, and no group seems particularly susceptible. Although the disease is named after the French doctor Mafan-who first identified a group of skeletal characteristics in 1896-it was not until the mid-twentieth century that studies were conducted. Marfan Syndrome is a relatively recent diagnosis. Marfan Syndrome affects the skeleton, lungs, skin, and nervous system. Since the connective tissue in the eye weakens, it also affects vision. Many patients with this disease are myopic or near-sighted. Over half of the patients suffer from the dislocation of the lens. Like the discovery of Marfan syndrome, the Rubik's cube developed from an appreciation of the pivotal role that connectivity plays in producing geometric forms; in mathematics this is called "group theory." The Rubik's cube, invented by the Hungarian Erno Rubik in Budapest in 1976, is an example of group theory in three dimensions. What Erno Rubik set out to do was create a three dimensional object, of aesthetic value, which was not only richer in configuration variations and more of a mental challenge than any puzzle in existence, but would also continue to be one self contained whole throughout its manifold transformations. Quite early in the study of the Rubik's cube, people realized that the terminology and tools of group theory would need to be better developed in order to understand this amazing object. It was the first mathematical toy to exemplify much of the theory of groups in a concrete way. One could actually hold a group in one's hand. Even experienced mathematicians found that they gained fresh insights into group theory as they struggled to solve the cube and to make sense of what they were doing. The principal unsolved problem of "cube theory" is finding the maximum number of moves to restore a cube to its initial or solved state. This is called the length of "God's Algorithm," or the diameter of the graph of the cube. Determining this requires examining something like all the positions of the cube, and there are 43,252,003,274,489,856,000 (or  4.3 X 1019) such patterns. If one could examine one pattern every microsecond, this would take about 1.4 million years. Since there are many millions of computers and computer speed is still increasing significantly, this computation is now approaching feasibility, and some scientists suspect the answer will be known by 2010 or2020. The Rubik's cube is group theory in practice; it encourages users to understand the construction of "groups" from bits or units. What is the relationship between Abraham Lincoln and Osama Bin Laden? What makes a group? Does medicine give us a model to understand groups as comprised of units that suffer equally from a lack of connectivity? Or are we all suffering from a lack of connectivity that affects human vision, but also the skeletal components of civilization? Despite these dour prospects, new forms can and will emerge from the cube's 43,252,003,274,489,856,000 possible patterns. 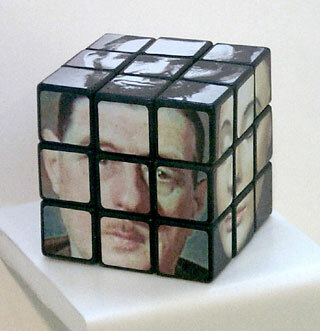 I have placed digital images of (in)famous individuals with Marfan syndrome on the Rubik's cube in order to encourage users to play with the possibilities of "connective aesthetics." New, perhaps myopic, relationships can be forged with this instrument. Although each image represents a seemingly unrelated historical figure, it is interesting to note that these individuals are liminal yet strategic figures in the process of cultural and/or historical transformation.